On today’s Coffee with Carrie, we will discuss how an on-demand video interview kills the candidate experience and why a two-way video interview is better. Work from home hiring process decisions that employ video interviewing saves time, money, and can grab better-qualified candidates. In this Coffee with Carrie, we will discuss the differences between phone screens vs. video screens and determine a winner. 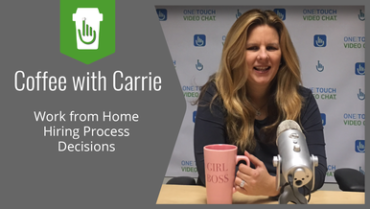 In this Coffee with Carrie, we will discuss why video interviews save travel costs for airlines and transportation companies. In today’s Coffee with Carrie, we will discuss why logistics companies should implement video interviews into their hiring process. In this Coffee with Carrie video, we will learn how live video interviews will help hospitals reach out to more high-quality candidates.